Spacetime defined, Relativity and Quantum Theories explained, for both beginning and advanced visitors, with links to the Best Academic Websites. Plus a look at evidence of the existence of Gravitational Waves. You are an Observer, always located at a single point in SpaceTime known as an Event. All Events in your lifetime, including birthdays and graduations, are assigned coordinates on an arbitrary map of SpaceTime, a single point designated by Width(x), Height(y), Depth(z), and Time(t). The path on which every Event in your lifetime is located, from birth to death. Every human being, in fact every particle in the universe, has their own WorldLine which is their fixed, permanent road through SpaceTime. SPACETIME VISUALIZED - Scientists do the best they can to draw a graph of 4D SpaceTime on 2D paper by drawing Height, Width, and Time but not Depth. The resulting diagram is something called a LightCone. Remember it is just an approximation of 4D reality. 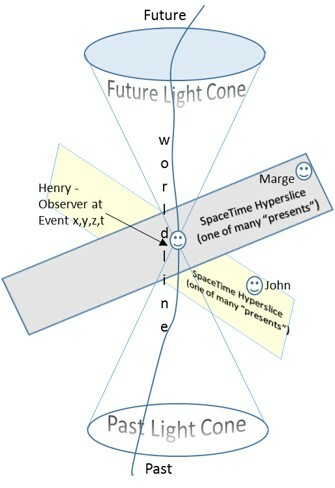 Einstein discovered something amazing about the Observers we call Henry, Marge, and John in the diagram above. If Henry and Marge look at their watches they will agree that it is the identical same time. If Henry and John look at their watches they will agree that it is the identical same time. But if Marge and John instantly compare watches they may find that it is 12 o'clock noon on Marge's watch but only 11 o'clock in the morning on John's watch! So if Henry and Marge, and Henry and John compare watches the times will be the same, but if Marge and John compare watches the times will be different! This is a proven consequence of Einstein's theories of relativity. "This new reality was that space and time, as physical constructs, have to be combined into a new mathematical/physical entity called 'space-time', because the equations of relativity show that both the space and time coordinates of any event must get mixed together by the mathematics, in order to accurately describe what we see. Because space consists of 3 dimensions, and time is 1-dimensional, space-time must, therefore, be a 4-dimensional object. It is believed to be a 'continuum' because so far as we know, there are no missing points in space or instants in time, and both can be subdivided without any apparent limit in size or duration. So, physicists now routinely consider our world to be embedded in this 4-dimensional Space-Time continuum, and all events, places, moments in history, actions and so on are described in terms of their location in Space-Time. Space-time does not evolve, it simply exists. When we examine a particular object from the stand point of its space-time representation, every particle is located along its world-line. This is a spaghetti-like line that stretches from the past to the future showing the spatial location of the particle at every instant in time. This world-line exists as a complete object which may be sliced here and there so that you can see where the particle is located in space at a particular instant. Once you determine the complete world line of a particle from the forces acting upon it, you have 'solved' for its complete history. This world-line does not change with time, but simply exists as a timeless object. Similarly, in general relativity, when you solve equations for the shape of space-time, this shape does not change in time, but exists as a complete timeless object. You can slice it here and there to examine what the geometry of space looks like at a particular instant. 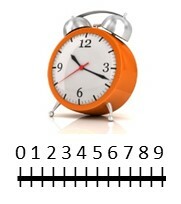 Examining consecutive slices in time will let you see whether, for example, the universe is expanding or not." Odenwald gives us the relatively simple, widely accepted, description of SpaceTime. Our links provide you with a solid understanding of the SpaceTime theories that most scientists believe are correct. But current definitions of SpaceTime only scratch the surface of the incredibly fascinating Alice in Wonderland like world of Physics. You can download NOVA Fabric of the Cosmos broadcasts from the iTunes store (4 HD episodes for $9.99), or buy the DVD version, or watch streaming episodes online (free) by clicking this link: The Fabric of the Cosmos. Oxford physicist and mathematician Roger Penrose says that space and time themselves are secondary constructs that emerge out of a deeper level of reality. Both Quantum physics, where the future is unknown, and recent experiments verifying quantum entanglement, where particles instantaneously communicate over infinite distances, challenge our basic ideas about spacetime. Alternate theories where space and time are minor players in our physical reality are still tentative and so mathematically dense that physicists can barely follow what is going on. We include links to articles that suggest what SpaceTime, Relativity, and Quantum Physics may look like in the future. (The Future of Fundamental Physics explains some of the problems with current theories. Reality Is Not What It Seems: The Journey to Quantum Gravity, a new book by Carlo Rovelli, is an excellent overview of the current state of theories about Space and Time. First some basics - Albert Einstein's theory of relativity is the foundation of the spacetime model. 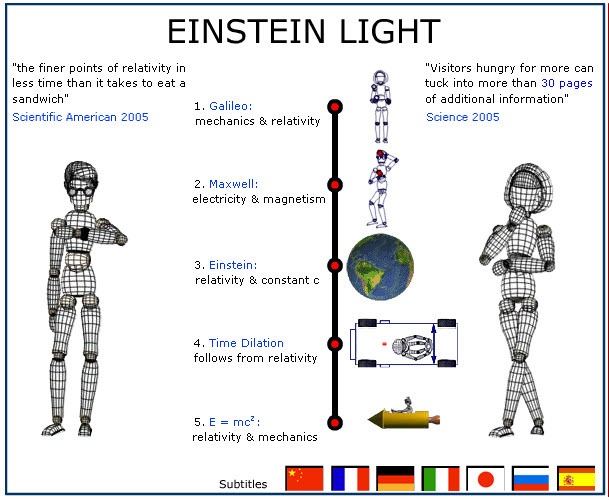 Click here for an excellent overview presented by the Max Planck / Albert Einstein Institute. If you are interested in a summary of Einstein's discoveries take a look at this video. Surprisingly there are not many good videos that explain Einstein's relativity. The following video is a bit boring and incomplete, but it does make some of the basics clearer than other sites. A high school student won an award for the following fairly easy to understand short film on relativity (beginner). Don't worry if relativity still seems weird - everyday experience makes it look confusing. Gravitational waves, predicted by General Relativity, were finally detected by LIGO in 2016 - this experimental success provides strong evidence that GR is correct. Click here for an overview of gravity written before the 2016 definitive discovery. Another excellent place for students to start is the University New South Wales award winning website Einstein Light (beginner - intermediate). Which has excellent videos, including explanations of Quantum Entanglement and the 2-slit Wave-Particle Duality Experiment. Here is our list of some of the best Websites [HR is Highly Recommended / bold HR is even better]. We do not necessarily agree or disagree with the content on any internet websites linked to below, including advertising on our site. If a web link is broken please tell us. Alternative Theories - Do we live in an Atemporal Universe? Being and Becoming in Modern Physics HR Excellent article on SpaceTime Metaphysics in the Stanford Encyclopedia of Philosophy. Einstein’s theories of relativity tell us that Space, for example - the room you are sitting in, and Time, the minutes that tick away on your watch, are all part of a single physical entity, the SpaceTime Continuum. SpaceTime has four dimensions, roughly corresponding to east-west, north-south, up-down, and past-future. We can drive from east to west, north to south, and go up and down mountains. While we are driving in any direction we are always driving from our past to our future – that is basically why space and time are linked, we can’t move through space without moving through time! Before Einstein, Isaac Newton shared the popular belief that both absolute time and absolute space exist. Newton believed that the grid that defined absolute space was undetectable, but that there is a universal time that ticks away for all observers in all locations, and that universal time can be accurately measured by clocks. If it is 5 o'clock on planet earth, it is simultaneously 5 o'clock on the most distant star. Similarly, Newton believed that absolute space exists that can be measured using the same yardstick (meter-stick) anywhere in the cosmos, a mile measures the same distance anywhere on Earth and on any distant star as it does where you are standing right now. There are lots of problems with this idea, experimental observations simply do not support the conclusion that absolute time and absolute space exist. In 1905 Einstein published his theory of special relativity, which introduced the then radical idea that different observers see the same event occurring at different times and places. For example, John and Marge may see two firecrackers that they ignite explode at exactly the same time, while Henry (in motion at a distance on his Speed-o-Light rocket motorcycle) may see John's firecracker explode a few seconds before Marge's. Einstein used the concept of relationships between frames of reference to explain how these "crazy" observations are real and actually do occur. Frames of reference may be thought of as invisible "coordinate map grids", like the letters and numbers on the sides of roadmaps, attached to every observer so that the observer can measure the position of surrounding objects. Special relativity tells us that observers who are in a state of uniform motion with respect to one another are in "inertial frames of reference", and that they cannot use the laws of physics to distinguish the frame of reference of one observer from the frame of reference of any other observer. In an inertial frame of reference, there is no physical experiment whatsoever that you can perform that can distinguish between a state of rest and a state of constant velocity (if you are going down in an elevator, a ball released from your hand does not fly to the ceiling). If you are in a windowless room, there is no experiment that you can perform in that room that will tell you if the room is stationary, or is moving in some direction at a constant velocity, or is in uniform "free fall" acceleration. Think about being in a silent electric car with all the windows painted black (you can’t see out so you can't tell if you are moving relative to the road and you can’t listen to the engine for clues about your speed). If the car is standing at a red light, and you put a coffee cup on the dashboard, the cup will not move. If the car is going a steady 120 miles an hour (you did not feel the acceleration because you were asleep), and you put the cup on the dashboard, the coffee will not fly back and hit you in the face. There is no experiment that you can do inside the car (which is your inertial frame of reference) that will tell you if you are standing at a red light, or going down the road at 90 miles per hour, or even 90,000 miles per hour! What happens when a car accelerates smoothly after the red light turns green? The same thing that would happen if the car fell (smoothly) off the edge of a cliff, as the car falls toward the ground below the coffee will still remain in the cup on the dashboard (until you reach the valley floor). Note that Newton's first law of motion, which in essence states that an object in motion will remain in motion unless acted on by an external force, is consistent with this result at lower speeds. So long as Newton's laws are applied only where relative velocities do not approach the speed of light, Newton's laws of motion give us "close enough" results, even in a relativistic universe. That is why they are still taught in schools as "true" physical laws. You cannot determine if the car is moving at constant velocity, or is standing still, or is in a uniformly accelerating gravitational free fall. That does not mean that you cannot determine non-uniform acceleration. If you press the accelerator so that the car "speeds up", or if you swerve from a straight path, you will feel the acceleration and be able to measure it (the coffee cup will fly off the dashboard). None-the-less, there is no physical experiment whatsoever that can distinguish between a state of rest, a state of constant velocity, and a state of gravitational free fall. Our solar system is located on a spiral arm of the Milky Way galaxy, which rotates at a constant velocity (creating a nearly inertial frame). If we did not live in inertial frames then every time we got out of bed the speed of our Earth rotating around the Sun rotating around the Milky Way galaxy(at about 155 miles/sec or 250 km/sec) would knock us to the floor! Every time we set the coffee cup down in our moving car, the coffee would hit us in the face! One startling conclusion that we reach from all this is that the velocity of light must have the same value for all inertial observers, even if they are moving toward or away from the source of the light. If this was not true, an observer could perform an experiment using a beam of light to measure the velocity of their inertial reference frame, and then use that result to determine which of several frames of reference (frames in constant motion) they were actually in. The disastrous results of a speed of light that is additive (not constant in all frames) would include being hit in the face by the coffee, and, even worse, being plastered to the floor by the speed of the earth flying through space. Experimental results fully support the counterintuitive predictions of special relativity. Clearly, the idea that the speed of light is constant is inconsistent with an absolute space that is distinct and separate from an absolute time. Modern physics replaces Newtonian space and time with a single entity, Space-Time. Minkowski, who along with Einstein formalized the math of Spacetime, said, "…henceforth, space by itself, and time by itself, have vanished into the merest shadows and only a kind of blend of the two exists in its own right." Space-time is essentially a "curved" geometric construct that allows for the relativity of simultaneity. In other words, if one observer correctly concludes that two events occur simultaneously, the same events would appear to take place at different times to an observer who was in motion relative to the first observer. Both the observer who measures the two events to be taking place simultaneously, and the observer who measures the events as taking place at different times, are right! Our example above is correct, one observer will see a firecracker they light and a second firecracker that a friend lights explode at exactly the same time, while a third observer moving relative to the other two will see one firecracker explode before the other firecracker. Relativity tells us that both are right! Both time and space are relative, and are "different" for observers in relative motion to one another. For one observer the two firecrackers actually did explode at precisely the same time, while for the other observer one firecracker exploded a few seconds before the other. The time and distance measured by each observer is different, both are right, neither is wrong! Relativity tells us that time and distance change depending on the relative motion of the observers. If Observer A measures the passage of one hour on their clock, another observer B who is in relative motion to observer A may measure the passage of 30 minutes on the clock. If Observer A measures a distance of one mile on their ruler, another observer B who is in relative motion to observer A may measure a distance of 1/2 mile on the ruler. We don't see time or distance shrinking on earth because the effect is virtually undetectable until the relative motion of two observers approaches the speed of light (299,792.458 kilometers or 186,000 miles per second). None-the-less, the time and distance measured by two observers in relative motion to each other is different, only the speed of light measured by all observers is the same. Einstein-Minkowski space-time is made up of three spatial dimensions x, y, and z, and one time dimension t. Space-time is commonly thought to be the history of the entire universe, containing every "event" that ever happens. A "world-line" is the history of an object in "space-time". Special relativity allows us to define a distance from the origin for all the points on a world-line, allowing the world-line to be a set of points that have physically distinguishable properties. Therefore, we can identify each of the events on a world-line as distinct points in space-time. Each point on the world-line is a particular event that happens at one place in space (represented by the values of the x, y, z coordinates) at one particular time (represented by the value of the t coordinate) - i.e. one place in space-time. Each point on the world-line of a human being is generally thought to be a real physical event that represents a unique sequential moment in the life of that individual, from birth to death. Einstein said “Imagination is more important than knowledge”. So to better understand what we are talking about set your imagination free and take a journey with me into space-time. First there is an underlying question, if we travel to the end of the universe and find a brick wall, what is behind the wall? 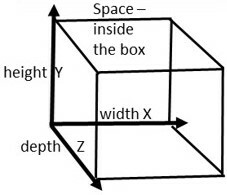 Is our universe inside a walled "container" that might allow us to measure distances from points on the fixed surface of the container? Or is our universe the container itself with nothing beyond the boundaries? If so then there is no fixed background we can use to measure time and space. Einstein's General Relativity favors a background free universe where distance and time are measured by relative positions of objects in our universe, Quantum Theory favors (but does not necessarily require) the existence of a complex, yet still fundamental, time. To better understand what "relativity" means imagine a universe that is totally empty except for one single ball. There is absolutely nothing else in the entire universe, no atoms, no rocks, no people, just a single ball we will call ball “A”. The ball is floating in totally empty space, there is no background behind it, no horizon, nothing. How far is the ball from anything else in this one object universe? There is no answer, because the ball is the only object in the universe, so there is absolutely nothing else in the universe that we can measure a distance to, not even some kind of background like a sky full of stars (we ignore the complex issues of rotation and frame dragging in our examples). Now add a second ball "B" to our universe. How far is it from ball A to ball B? We reach for a ruler – but wait – remember that the only two objects in the entire universe are the two balls, there are no other objects, no rulers, not even a background grid to measure against! Just two balls floating in nothing. Here we can see the problem - since there are only two objects in the entire universe, ball A and ball B, there is no ruler you can go get to measure the distance between ball A and ball B. There is no way whatsoever to measure the distance between A and B because there is nothing to compare the positions of the balls to. So it seems that we must conclude that there is “separation” but there at least appears to be no such thing as "distance" in this two object universe. Add a third ball "C" to the universe (remember there are three objects A, B, and C in the universe and absolutely nothing else). By comparing the distance from A to B to the distance from B to C – we see that the separation between A and B is five times greater the separation from B to C.
Remember – you are looking at these drawings on a computer screen or on paper. The screen/paper gives us an extra “object” that really does not exist in our one, two, and three ball universes. There is no background in our examples, the balls are simply suspended in empty space. As you read remember, and imagine, that there is no screen, no paper, no background – the balls simply float in absolute nothingness. then the distance from B to C would have been 1/5th the distance from A to B. We can ask what the distance is from A to B by comparing it with B to C - and say that it A to B is 5 times the distance from B to C, or we can ask what the distance is from B to C by comparing it with A to B - and say that B to C is 1/5th the distance from A to B. What we have done is to choose A to B or B to C to be our "ruler". That is what we human beings do when we build a "meter" (or a "yard") stick, we define the distance from end of a wooden stick (A) to the other end (B) to be one meter (yard) so we can use it to measure the distance between any other points in the world. Because we are using endpoints A and B that we arbitrarily chose to define a meter (yard), we are comparing the distance from endpoint A to endpoint B and endpoint B to endpoint C, just like we did with the three balls in the three object universe. What all this tells us is that what matters is the relative position of objects in the universe, not the absolute position, because there is no absolute position. We measure the relative position of objects and that allows us to measure the relative distance between two objects. That is what relativity is all about, there is no absolute distance because there is no background, no “piece of paper”, to measure absolute distances against. Use your intuition to realize that for every change in the relative position of A and B there is a physical limit on the change in relative positions of A, B, and C – in other words there is a physical limit on the speed in which objects can move away from each other. It is a tiny bit like the fact that when you get in your car to go to the grocery and step the accelerator to the floor, there is a physical limit on the change in how far you are from your house and how close you are to the store. No matter how hard you press the accelerator the speedometer will never reach 500 miles per hour, and it will always take you a minimum length of time to get from your house to the store. In the universe in which we live there is a physical limit on the change in relative position of all objects, including balls A and B and C, it is called the “speed of light”. Light can be thought of as being little balls of energy called photons (I know we are oversimplifying and the descriptions are really not right – but they illustrate our points). Assume ball A nd B are physical objects and ball C is a photon “ball”. Because of physical limits on the change in relative positions, i.e. on the speed the three balls can separate from each other, physical ball A and physical ball B can never move apart (change relative position) so that the rate of change in relative position between ball A and ball B is greater than the rate of change in relative position between ball A and photon C or ball B and photon C. In other words A and B can never speed apart from each other so that they go faster than a photon speeding away from A and B, faster than the speed of light. The speed of light is a physical limit on the motion of every object that is part of our universe, period. Now here is where it gets weird, or weirder. Instead of three balls in an empty universe, let’s look at John, his brother Henry, and their friend Marge. John is having his morning cup of coffee with Marge at the local café. His brother Henry is back at the house where both live. John and Marge leave the café and get on their “Speed-o-Lite” rocket motorcycles. Both start driving off away from Henry at almost the speed of light. Henry waves good-bye. So far no problem. Relative to Henry, John and Marge are speeding off (changing relative position) at almost the speed of light – but John and Marge are driving beside each other so they are not moving apart at all. If the roadway is smooth, John could hand Marge a cup of coffee and she would not spill a drop. A police officer sees John and Marge fly by and measures their speed to be just under the intergalactic speed limit, 299,792.5 kilometers per second (It has been correctly pointed out to us that a stationary police officer at Henry's house must view the moving clocks on John and Marge's motorcycles through a telescope, or wait until they bring the clocks back to Henry's house, to determine their relativistic time and distance and calculate their speeds, or the police officer must have his own Speed-o-Lite motorcycle). Marge wants to try out her new bike, so she pushes the accelerator and shoots ahead of John – pulling away from John at what John and Marge measure to be almost ½ the speed of light – wow!!!!! So John is moving away from Henry at almost the speed of light, and Marge is moving away from John at ½ the speed of light, Marge must be moving away from Henry at 1 and ½ times the speed of light – right? The police officer thinks so, and gets ready to write Marge a speeding ticket. Wait a minute, we said that the physical limit on how fast any two objects can move away from each other is the speed of light – so John is moving away from Henry at almost the speed of light and Marge is moving away from John – but Marge must be moving away from Henry at a bit less than the speed of light????? I am confused? This is where space-time takes over, and keeps Marge from getting a ticket. Now the amazing thing - the ruler the police officer uses to measure how far Marge and John are from Henry shrinks, and the clock the officer uses to determine how fast Marge and John cover the distance slows down. The result is that the police see both Marge and John speeding away from Henry at less than the speed of light! Remember that the ruler and clock that John and Henry use to measure John's distance and speed relative to Henry shows John moving away from Henry at 99.999999% of the speed of light, and the ruler and clock that John and Marge use to measure Marge's distance and speed relative to John show Marge moving away from John at ½ the speed of light. None-the-less, the ruler that the Police use to measure Marge and John's distance relative to Henry shrinks (talking about physical rulers is a bit less intuitive than talking about distance - the Police measure the distance Marge travels as just enough less than what they would see if she was going faster than the speed of light) and the clock slows down just enough (the Police measure that clocks are running just slow enough so Marge can travel the distance without going faster than the speed of light - i.e. she is still going slower than the speed of light) so that Marge is not breaking the speed laws of Physics, she is not going faster than the speed of light relative to Henry or John or anyone else! Think about this weird result. Since Marge's clock is slowing down and Henry's clock is not slowing down, when she turns around and flies back to Henry's house she will find that less time has passed for her than for him. If she decided to go on a light speed vacation when both she and Henry were 20 years old, when she returned she might find that Henry was 60 years old while she was only 25. That may seem strange and even impossible, but remember that Marge's clock is running slower, for every hour that passes on Henry's clock Marge's clock may only tick off a minute. All of this is why distance and time depend on the relative position and the change in the relative position, not absolute position, of objects. If distance and time did not change depending on the relative positions of objects in motion, those objects could move apart at speeds greater than the speed of light, the physical limit no object can exceed, and the world would be an even weirder place than it is. If you are having trouble visualizing time and space dilation click on this link to Einstein Light for excellent (Adobe Flash) animations. Once you understand the concept of measurements being relative, the idea of rulers shrinking, and clocks going slower, is not as strange as it might seem. This is what Space-Time is all about! There has been a lot of recent interest in what once seemed to be an impossible question, what happened before the Big Bang, the starting point of our universe? For many years it was assumed that any physical process that triggered the Big Bang was outside time and space, and that there was no answer to the question. We are now confident that the uncertain nature of quantum measurements might allow for fluctuations in the energy that was in the universe before the Big Bang, which in turn could have triggered the Big Bang and generated matter (Energy = Matter times the Speed of Light squared). This may well be correct, but there is a popular misconception that quantum fluctuations explain the creation of the universe. In fact understanding the mechanism of creation of matter out of “nothing” does not help with the question why was the fluctuation itself fine tuned to select the phase space of our low entropy universe from all other possible universes? It remains true that the odds against our universe having been created at random by a quantum fluctuation or any other mechanism are as close to zero as imaginable. Ideas like multiple universes are extraordinarily unlikely to provide a solution because of the almost infinite number of alternate universes that would be necessary for our low entropy universe to emerge. It remains logical to conclude that our universe was not created at random (Click here for 'How special was the big bang?' by the noted physicist Roger Penrose). We use Google Analytics to make our site better. Some images are courtesy of NASA and WikiMedia.